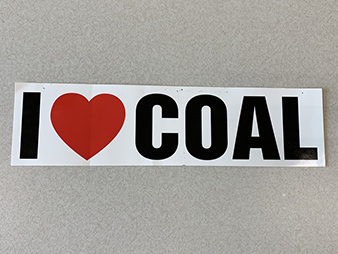 HOUSTON — Patti Poppe used to drive around with an "I 'heart' COAL" bumper sticker, but now the CEO of Michigan-based CMS Energy Corp. is eager to talk about phasing out the fossil fuel. "There's no room, in my opinion, for coal-fueled generation in a clean and lean future," Poppe said. CEO Curt Morgan of Texas-based Vistra Energy Corp. loves coal-fired generation but sees economic and climate headwinds. He expects a rash of U.S. coal plant closures over the next two decades. "I think gas will be the companion technology along with renewables," Morgan said. And CEO Mauricio Gutierrez of NRG Energy Inc., whose fossil fuel portfolio includes a stake in a carbon capture project, emphasizes a belief that the U.S. power industry is "going to be low carbon" even if some coal may remain on the grid as technology evolves. 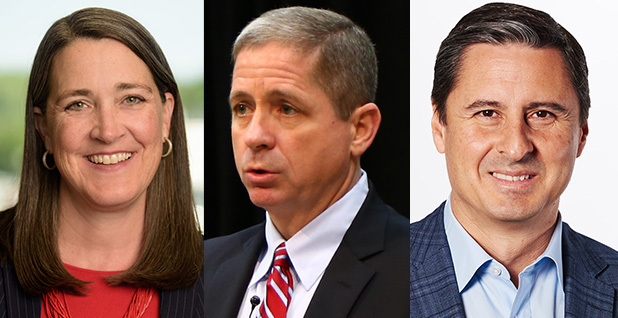 The three chief executives — as well as CEO Pedro Pizarro of California's Edison International — recently spoke with E&E News while in Houston, where they attended CERAWeek by IHS Markit. In separate discussions, the executives described the economics, technology and trends driving the electricity sector in a greener direction. They illustrate how power companies aren't waiting for Congress or the White House to deliver a new energy policy initiative or a federal Green New Deal. They're preparing for a cleaner energy mix. "While they're discussing it, thinking about it, arguing about it in Washington, D.C., I can speak for our team," Poppe said. "In Michigan, we're going to be doing what it takes." A debate remains about whether leaders in the power business could or should move faster to reduce emissions of carbon dioxide, which is a greenhouse gas. There's also no national consensus on how to treat carbon-free output from aging nuclear plants. But electric companies are being pushed by state policies and economic factors toward a cleaner future that will influence how both regulated utilities and merchant players operate. CMS Energy's Consumers Energy utility has plans to cut carbon emissions at least 90% by 2040 compared with 2005 levels. The company shut down almost 1,000 megawatts of coal-fueled power in 2016, and it expects to cease producing power from coal by the end of 2040. To be sure, federal incentives for wind and solar have been factors for years in U.S. renewable energy development. And power CEOs who spoke with E&E News in Houston still see important roles for the federal government. Their wish list includes a fully constituted Federal Energy Regulatory Commission to make decisions related to power markets and pipelines. Companies also would like to see significant research dollars go toward energy storage and a changing grid. Paul Patterson, an analyst with Glenrock Associates LLC, said it's clear why electricity companies are focused on state policies and FERC instead of Congress: They can only wait so long for movement. "If they thought Congress was going to pass sweeping energy legislation, I think you'd see them all over there," Patterson said. States could dramatically affect the power sector, Patterson said, through efforts to add renewable energy and reduce power demand. And he thinks those efforts have the attention of competitive generators such as NRG and Vistra. "They're going to do their darndest to basically position themselves to deal with a potential tsunami of renewable- or clean energy-related legislation or related policies that the states are implementing," Patterson said. It's also true that the energy transition isn't without conflict at the state level. In Michigan, CMS Energy's home state, tensions have flared over connections of renewable energy projects under the federal Public Utility Regulatory Policies Act (Energywire, Feb. 14). Consumers Energy recently announced the filing of a settlement related to a potential clean energy plan for Michigan. In Texas last year, Vistra removed more than 4,000 MW of coal-fueled generation from the state's main power grid. That has contributed to worries about narrower summer reserve margins. And Vistra has agreed to shut about 2,000 MW of coal-fired generation in Illinois as part of a proposal that would give the company more flexibility in how it operates other parts of its fleet. The company also supports legislation that would bolster solar and energy storage in Illinois (Energywire, March 26). NRG plans to lower carbon emissions 50% by 2030 and 90% by 2050 from a 2014 baseline. It has recalculated its numbers given a changing asset mix, but it has kept the goals. The company also has defended its sale of a renewables business, saying NRG is well-positioned to facilitate green offerings. Gutierrez said power companies can help businesses and customers push toward a lower carbon footprint, regardless of what's happening on federal climate and carbon policies. "Perhaps one of the catalysts is just the vacuum of, you know, things coming from Washington," Gutierrez said. The Green New Deal at the federal level is backed by Rep. Alexandria Ocasio-Cortez (D-N.Y.) and Sen. Ed Markey (D-Mass.). It includes a goal of net-zero greenhouse gas emissions. CEOs are aware of the discussion, even if it's not on the front burner as they await more specifics. Gutierrez called the Green New Deal "aspirational." He also said companies are taking leadership roles in the energy shift, noting groups such as RE100 and EV100 that promote a move toward renewable energy and electric vehicles, respectively. Morgan said the Green New Deal pushes dialogue to an extreme. "When you're making change that is so fundamental to society," he said, then "you have to be worried about the kind of disruption you can create." Still, Morgan said there's going to be a significant shift in how power is generated in the United States. He expects progress in decarbonization and electrification, with batteries and probably some additional gas-fired plants probably needed. He said bailouts for nuclear and coal power plants would interfere with competitive markets. A coal plant can have five to six times the number of employees and three to four times the amount of operating and maintenance expense as a gas plant, Morgan said. A renewable facility also could run with far fewer people than a coal plant. "We're going to replace both combustion engine cars, and we're going to replace coal with renewables," Morgan said. "And that trade-off is a good one for the climate." Poppe, who used to work for Detroit-based DTE Energy Co. and General Motors Co., made sure to discuss what she considers the inefficiency of a power grid that's underutilized much of the time. She said two things are helping make the grid more efficient — electric vehicles and smart home devices such as thermostats and smart meters. She sees a need to soften peak demand. "If you can shave that peak, then you can shave the supply and our whole energy infrastructure in the country can be more efficient," she said. Poppe also envisions strong electric vehicle growth over time — with perhaps 30% to 50% EV penetration by 2050 in the United States for light-duty passenger vehicles. She said the existing grid can handle an influx of EVs, with some localized needs likely for substations or transformers. "The transition from internal combustion engines to electric vehicles can actually fundamentally reduce the unit cost of energy," she said. "So the per-kilowatt cost of electricity will go down." Pizarro said he thinks much of the benefit would come if consumers charge their EVs at the right times. And in California that would be when solar is peaking during the day and cars could store power for later use. The answer might be different in different places. Edison continues to point to a 2017 white paper that laid out various goals for California, including putting millions of electric vehicles on the roads. "The system's really dynamic, and so working both the supply side and the demand side's really important," Pizarro said. To Gutierrez, the power industry is at an inflection point. He pointed to change tied to automation, artificial intelligence, and devices that are connected and talking to each other. Looking ahead, he sees important roles for renewable energy, battery storage, natural gas and controllable demand. Parking lots can be power plants and load centers, he said. Gutierrez touted energy efficiency, saying, "The cleanest megawatt that you have is the one that you don't use." And he sees electricity as the fuel of choice in a digital, connected economy, meaning electricity use could climb on a relative and absolute basis. "So we consumers need to decide: What is the type of value proposition that we want power to be?" Gutierrez said. During a CERAWeek panel, Morgan said, "The one thing I think is a constant is going to be owning the customer and providing a service to the customer." In an interview, he said people don't want to worry about electricity. That means companies such as Vistra can be of service as a retailer with a variety of options. Morgan said the right price signals should be sent to customers, who could then decide whether to adjust usage. "People may want different products, but they want it to be easy," he said. Pizarro, who noted his own role on the board for Argonne National Laboratory, remains a proponent of federal research that could lead to grid improvements. He said technology is becoming cleaner. And innovation is a "critical engine" for the economy, he said, whether that's for climate reasons or to preserve American competitiveness. For Poppe, a discussion of energy often comes back to what she calls a triple bottom line for CMS Energy. That means serving people, planet and prosperity. She pointed to efforts to move workers to other positions from closing plants if they don't retire. Consumers Energy has discussed plans to boost its renewable energy supply with thousands of megawatts of solar via competitive bidding by 2030. With an exit from coal generation planned around 2040, the utility may rely on elements such as renewables, energy efficiency, natural gas-fueled power and market purchases. It has received electricity for years from the Palisades nuclear plant, which is slated in close in 2022. Poppe, who had a pro-coal bumper sticker on her car before she became CEO of CMS Energy, now has one in her office. During a recent interview in Houston, she outlined a message for people about coal shutdowns and the energy transition. "I believe and our company believes climate change is happening, but if you don't, it's OK because the retirements are economic," she said. "We can retire coal, switch to cleaner renewable sources to the advantage of the economics of customers."